When I was a kid, there was nothing quite as exciting as picking out Valentines. I loved roaming the store and looking at every single one. To this day, I love wandering the Pinterest looking at all the smokin’ cool Valentines kids have these days. Man, when I was a kid? There was 12 different Valentines and no matter how hard you tried, it was pretty much guaranteed that some girl at school would have the same ones, only hers would have glitter and therefore be infinitely cooler. I wanted to try to recapture some of that ol’ Valentines magic. Holy Woof, they turned out cuter than I ever hoped. I always loved getting sweet Valentine Candy treats and we all know Kolchak loves getting treats of any kind. 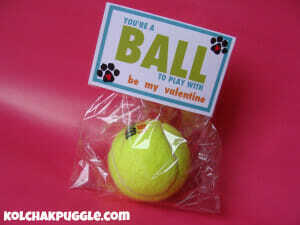 My goal was to make a special Valentines Day treat just for my furry friends. 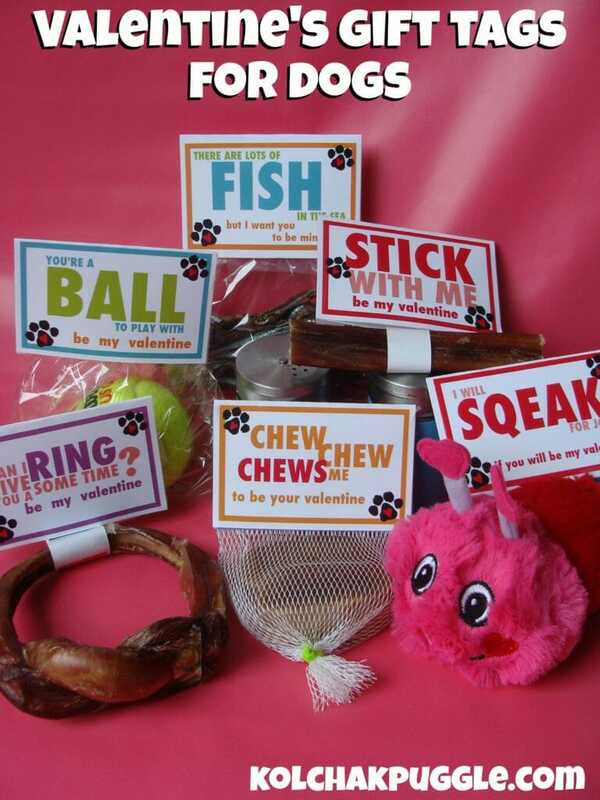 Whether you want to say Thank You to the folks at your doggy daycare, show your dog park pals that you are grateful for their friendship or even just have a bit of fun with your own dogs, these Valentines are an adorable way to say you care. You get the reference right? RIGHT?! 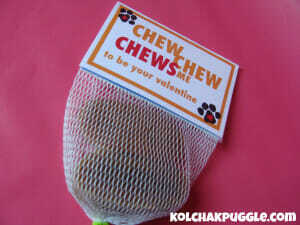 *giggles uncontrollably* These are perfect to go with a yak’s milk chew, any edible chew or even a durable chew toy. 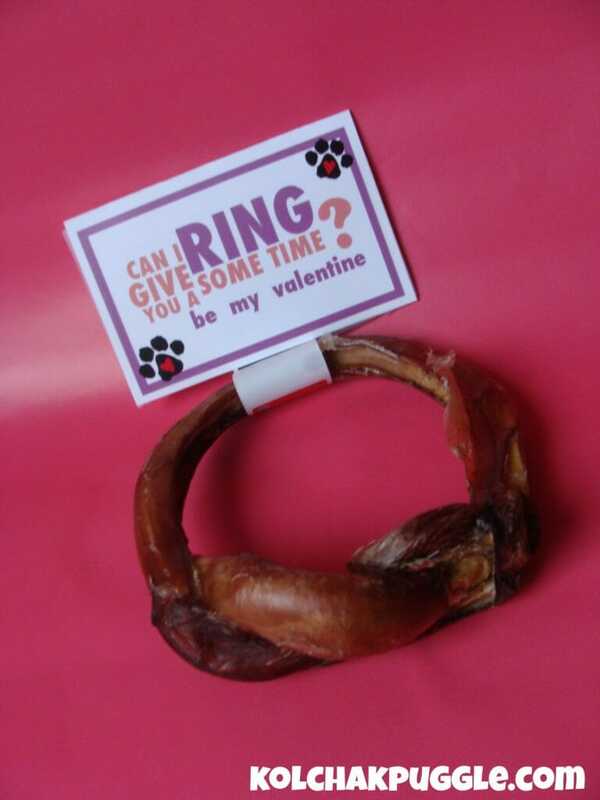 Not pictured: “I’m not CHICKEN to ask you to be my Valentine” for giving with chicken chews, chicken treats or a rubber chicken toy and “No BONES about it, I want you to be my Valentine” for giving Nylabones or other toy bones, raw or smoked bone chews or done bone baked treats. If you want the whole set of printable Valentines Gift Tags for Dogs, you can find it in our newly created LoveFelix etsy shop! *squeeeee* I know right? 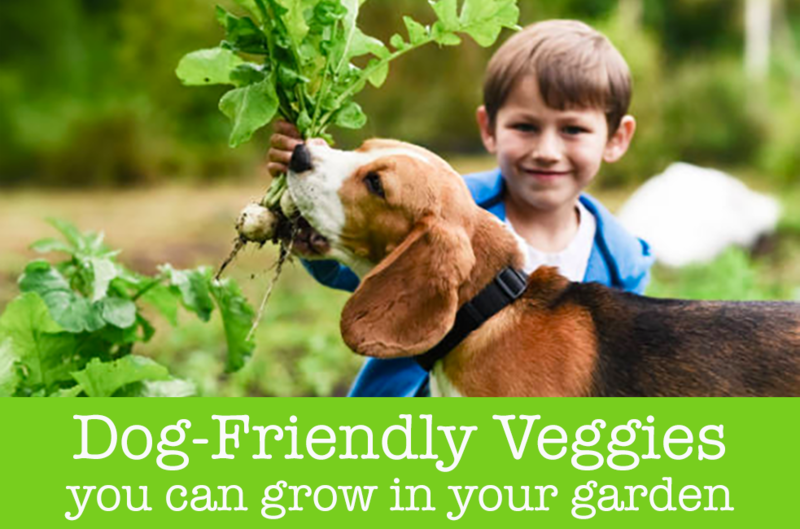 This is another one of those big changes Ihinted about in my Pet Blogger Challenge post. 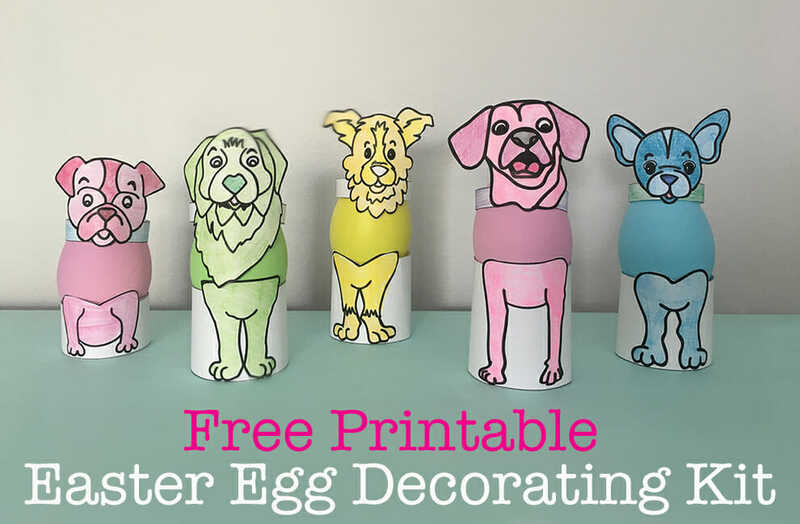 We’re going to be sharing the printable versions of some of our favourite projects, easy ready to print versions of our favourite Doggy Scrapbook pages (like this Live Love Bark page) and more! but, since you guys are totally awesome, we’re sharing the free printable PDF file for the “Chew Chew Chews Me” Valentines. This is a blog hop! Every week, we invite you to link up your Tastiest Post and Hop On to discover all sorts of new treats recipes, great giveaways and more! 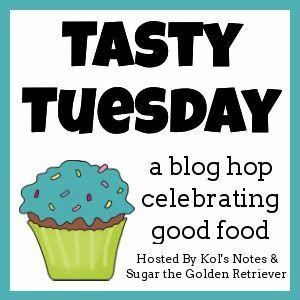 To join in, follow your hosts, Kol’s Notes & Sugar the Golden Retriever, grab the badge from our sidebar and add your link to this week’s hop! Awwww, I’m sure residents would LOVE them. I made bone shaped cookies to take on one of our nursing home visits when my GG was still alive and the dogs and I took them around. People thought it was a hoot (Their word, not mine). 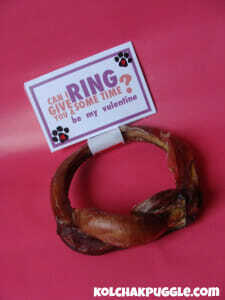 That is a super cute idea! Mom says her favorite thing was decorating a shoebox for the class Valentines Party. Sounds weird to me. Good luck with your new store idea too! Ohhhh…making the mailboxes was always such fun! And then the parties with all the red & pink treats?? *sigh* Being an adult is not nearly as fun. These are adorable! 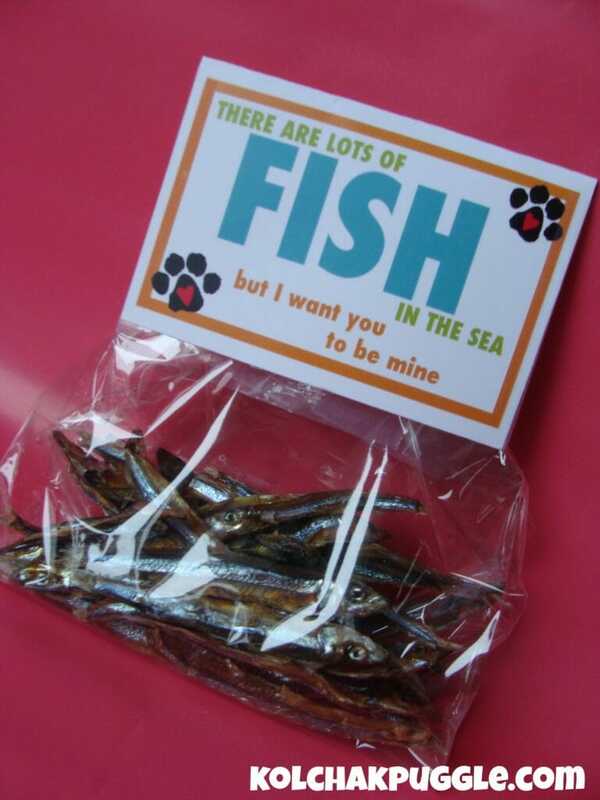 I love the idea of getting something sweet for my doggy friends – now I just have to find a cute gift that will work with one of these! Happy Shopping! When you find your special gift, I would love to see a picture! These are so cute! I love Etsy, off to add your shop to my favorites now. Thank you Lara. I’m super new to it, but I’ve been an avid Etsy *shopper* for years, so it was a natural move for me! I’ve got a little vintage shop on Etsy, but I haven’t done much with it in a while. Sales really dropped off when they made some changes to their search functions. Aww, so cute. I love that they aren’t all food-related, since (as I’m sure you understand) the food allergies have made me PARANOID about giving or receiving food gifts. And good for you on the Etsy shop! It’s very clever that you make a product you don’t have to mail–that would be the death of me. You should make a cookbook or some printable recipe cards to sell in there. You know what they say about great minds right? 😉 Hopefully by the end of February, I will have a binder cover, printable binder pages and printable recipe cards available in the shop. Recipes will be available individually or as sets of similar items. Those are adorbs! 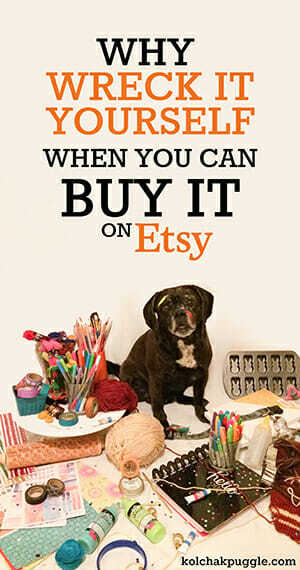 Good luck with the etsy store! I always loved Valentine’s Day until, when I was in 3rd grade, a classmate totally misinterpreted my feelings for him when I drew a heart on the card I gave him, and he spent the rest of the school year stalking me. Geesh. But these printable tags are adorable! Sharing! That’s a harsh lesson to learn so early. It was at least high school before I had a creepy stalker. Perhaps I was a late bloomer? These are so cute and clever. I can’t believe valentine’s day is almost here. I need more time to decorate and craft! I know! I never seem to have enough time before a holiday to make all the Projects I want! Yay! Congrats on your Etsy store! Cute idea. Can’t wait to see what comes next! Those are so cute!! What a great idea for those of us who don’t have little ones (non-furry) to do stuff like this for. Thanks for sharing the file! I’m going to check out your store now! *SQUEEEEE* These are SO CUTE!!! 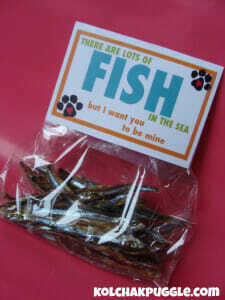 I can just see so many Jones chews wearing these adorable tags! Off to tweet and Facecrack this one! There should be one for lambykins. What cute ideas! We will be using these! Thanks! Adorable!! Congrats on your Etsy opening! I’ll make sure to go visit! Those were totally awesome, very cleaver! Thanks for sharing.